A “central line” is a tube that is placed into a patient’s large vein, usually in the neck, chest, arm, or groin. The tube is often used to draw blood, or give fluids or medications. It may be left in place for several weeks. A bloodstream infection can occur when bacteria or other germs travel down a “central line” and enter the blood. If your child develops a central line-associated bloodstream infection, he or she may become ill with fevers and chills or the skin around the catheter may become sore and red. A central line-associated bloodstream infection is serious but often can be successfully treated with antibiotics. The catheter might need to be removed if an infection develops. Decreases in infections save additional hospitalizations and excess medical costs. A committee including doctors, nurses and a parent representative reviewed the best ways to improve and standardize central line care throughout the hospital. Our hospital has adopted guidelines designed to reduce bloodstream infections. These guidelines, from a national network, are developed from evidence-based research. The network is collaboration of more than 100 children’s hospitals focused on reducing hospital-acquired harm to patients. Our goal is to continuously reduce the number of infections until we reach zero. 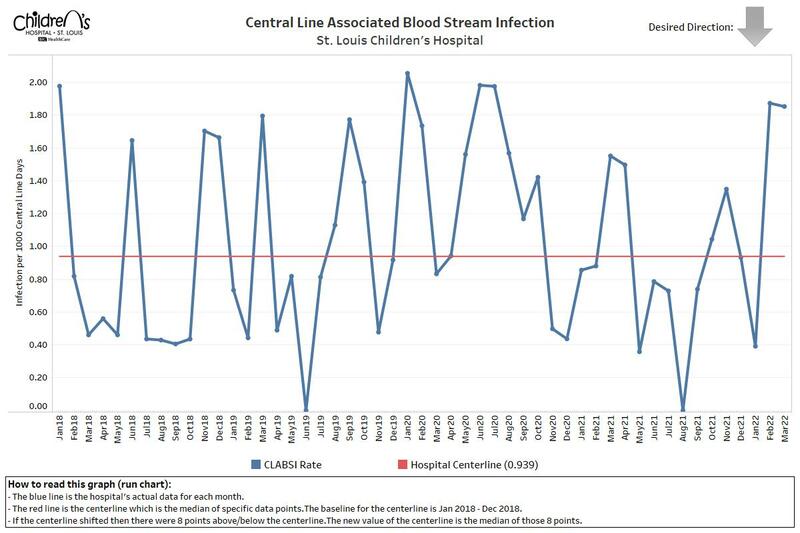 What can families do to help prevent central line-associated bloodstream infections? Good hand washing is the most important way to prevent infection and the spread of germs. Make sure family and friends clean their hands with soap and water or alcohol-based foam before and after visiting. Ask your doctors and nurses to explain why your child needs the central line and how long he or she will have it. If the bandage comes off or becomes wet or dirty, tell your nurse or doctor immediately. Tell your nurse or doctor if the area around your child’s central line is sore or red. Do not let family and friends who visit touch the catheter or the tubing. Do not let your child play with the end of the line or put it in his/her mouth.